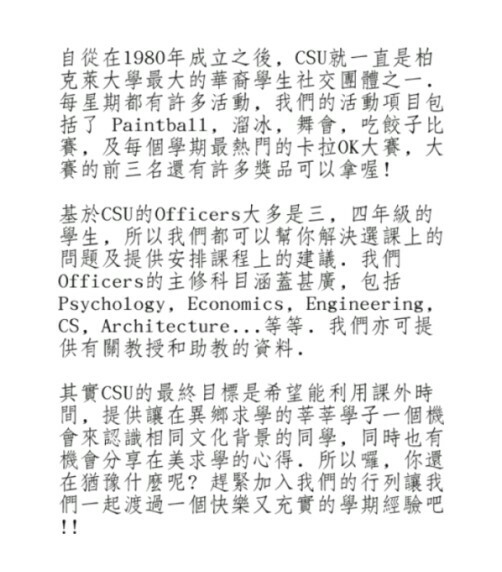 Established in 1980, CSU is one of the most prominent social organizations on campus. Our goal is to promote Chinese culture among the student body at Berkeley, as well as service the social needs of both Chinese and non-Chinese alike. Whether it's Karaoke Night, or Paintball, all our events bring together our members under a fun social atmosphere. Join us for the 1999 school year for an experience that you'll surely not forget.